When it comes to good-for-you ingredients, quinoa is one of the best. 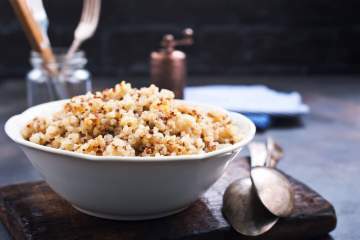 Quinoa is protein-rich, has twice as much fiber as many common grains, and contains iron, magnesium, lysine, riboflavin, manganese, and many other vitamins and minerals. Use quinoa just like you would use rice and other whole grains in all your favorite recipes and side dishes. Looking for somewhere to start? Try this delicious Southwest Quinoa Salad, Banana Quinoa Muffins, or Quinoa Fried Rice. The Ultimate Guide to Quinoa includes everything you have ever wanted to know about this superfood. Learn five different ways to prepare it, discover all its health benefits, and find delicious recipes for side dishes, salads, soups, main courses, and even breakfast.